The threat of water-borne diseases is rising in South Asia, where millions of people are homeless or cut off in their villages because of monsoon flooding. The threat of water-borne diseases is rising in South Asia, where millions of people are homeless or cut off in their villages because of heavy monsoon rains and flooding, aid workers say. Helicopters were flying over northeast India on Saturday, but were only able to help afraction of those who needed food and supplies,Red Cross officials said. The worst-hit states are Bihar, Assam and Uttar Pradesh, where hospitals are packed with people suffering water-borne diseases, said the United Nations Children's Fund (UNICEF). So far this year, some 14 million people in India and five million in Bangladesh have been displaced or marooned by flooding, according to government figures. Health workers were fanning out across parts of the two countries on Saturday to try to prevent the spread of diarrhea, typhoid and cholera. With hundreds of villages submerged across the fertile plains that stretch along the southern edge of the Himalayas, people were taking refuge wherever they could. Women and children were spotted screaming for help from treetops in Uttar Pradesh. In parts of the state, river levels rose so quickly that villagers had no time to save any belongings. "The gush of water was so sudden we did not get the time to react," Vinod Kumar, a resident of a village in Basti district, told India's Enadu TV. One woman in Uttar Pradesh, who identified herself only as Savitra, said she had not "eaten anything for the last two days." 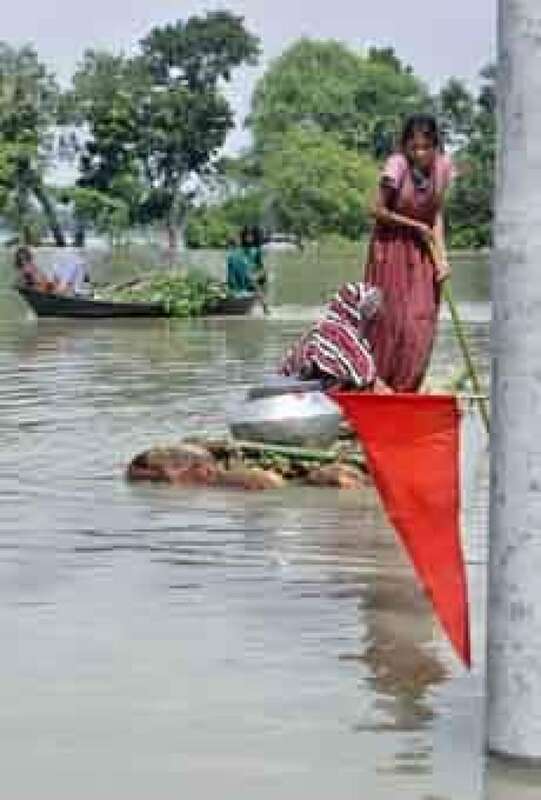 In northwestern Bangladesh, farmer Rahmat Sheikh and his family were among 2,000 people who fled their flooded village for higher ground in the Sirajganj district. "The floods have taken away all I had," said the 40-year-old Sheikh. "Rice paddies in the field, two cows and my house all are gone. I don't know how we will now survive." Umesh Sinha, the state relief commissioner in Uttar Pradesh, estimates that flooding has destroyed 113,000 hectares of rice crops in the region.